Type 2 diabetes is a multifactorial metabolic disease characterized by persistent hyperglycemia and derangement lipid metabolism which is associated with deficiencies in insulin action or insulin resistance (IR) which can be considered as a clinical state of low insulin sensitivity ,. Long-term hyper-glycemia is related to progression of end-organ damage in the eyes, kidneys, and the brain . Diabetes mellitus is a chronic disease that affects about 5-10% of the world population. It has been estimated the global burden of diabetes was 171 million in 2000 and it would rise to 366 million by 2030 ,. Free radicals of oxygen are formed excessively in type 2 diabetes and cause oxidative stress which has been thought to play a critical role in the pathogenesis of diabetes and its complications . Furthermore, hyperglycemia causes over production of free radical and causes a depression on natural antioxidant defense agents such as glutathione or vitamin C and thus creating oxidative stress . Despite of different existing types of chemical hypoglycemic agents such as a-glucosidase inhibitors, glibenclamide, and metformin for curing type 2 diabetes, administration of these drugs do not restore normal glucose homeostasis in long term, they have serious side effects  as well as high cost. So there is a renewed interest to search newer anti-diabetic agents. Recently, WHO recommended investigating hypoglycemic agents from plant origin because plants used in the traditional medicine have fewer side effects . Ethnobotanical information indicates that more than 800 plants are used as traditional remedies for the treatment of diabetes . One of these medicinal plants is R. coriaria (sumac), which belongs to the Anacardiaceae family. This plant has small fruits with a sepia color . According to the available literature, sumac contains phenol acids and flavonoids, such as gallic acid, methyl gallate, kaempferol, and quercetin . Flavonoids are especially, recognized as antidiabetic and free radical scavenging factors with protective effect on insulin producing β-cells in treatment of diabetes ,. Previous studies have also indicated antioxidant activity of R. coriaria seed extract . Giancarlo and his colleagues indicated in vitro hypoglycemic activity of the R. coriaria seeds extract through a-amylase inhibition . However, no studies have been conducted previously to assess the in vivo effect of this plant on hepatic enzymes levels and other blood factors associated with type 2 diabetes disease. So the present study aims to scrutinize hypolipidemic, and mechanism of antidiabetic effect of R. coriaria seeds and also the effect of this plant on hepatic enzymes on nicotinamide-streptozotocin (NA-STZ) induced type 2 diabetic mice. Dried seeds of R. coriaria (sumac) were obtained from a reliable green grocery in Ahvaz, Iran and certified scientifically by the Botany Department of Jundishapur University of Medical Science, Ahvaz, Iran. Voucher specimens of the plant are deposited in the herbarium of University of Tehran (Tehran, Iran. No. PRL/JH 22/03). After desiccation, the seeds were crushed under shade, and powdered using an electric grinder. To make R. coriaria seed hydro-alcoholic extract, 3 kilograms of acquired R. coriaria seeds' powder was soaked in 1200 mL of a distilled water-ethanol mixture (60:40) and kept for 72 h at room temperature. After filtering the combination with What-man No. 1 filter paper, it was centrifuged at 3500 rpm for 20 min. Finally, the supernatant was taken away and dried at 37°C, and the acquired semisolid mass was refrigerated until use . 56 adult male Naval Medical Research Institute (NMRI) mice (30-35 g) were obtained from the animal house of Jundishapur University of Medical Sciences (Ahvaz, Iran) and were hold in cages in standard laboratory conditions (temperature: 2 ± 4°C with a 12 h- 12 h light/dark cycle); they were permitted to have normal commercial chow and tap water. All procedures involving animals were approved by the Animals Committee of Ahvaz Jundishapur University of Medical Sciences (ethical approval code: 143) and conducted in accordance with the Guide for the Care and Use of Laboratory Animals. In order to induce type 2 diabetes in adult male NMRI mice experimentally, nicotinamide (NA, 120 mg/kg) (Sigma Aldrich, USA) dissolved in normal saline was injected intraperitonealy (i.p. and then after 15 min the mice received a single dose of streptozotocin i.p. (STZ, 65 mg/kg) (Sigma Aldrich, USA) which was dissolved in citrate buffer with pH 4.5 . Hyperglycemia and diabetes development was confirmed by measurement of animal blood glucose levels 72 h after the NA-STZ injection. Eventually, mice with fasting blood glucose levels more than 200 mg/dL were considered diabetic, and the other animals with lower serum glucose levels were banished from the following experiments . Animals were randomly assigned into 7 groups of 8 in each group as follows: Group I, control group administered normal saline; Group II, diabetic mice; Group III, diabetic mice received glibenclamide (0.25 mg/kg body weight, Sigma Aldrich, USA); Groups IV and V, diabetic mice given orally the hydro- alcoholic extract of R. coriaria seeds (in doses of 200 and 300 mg/kg, respectively); Groups VI and VII, normal intact mice whod received the same extract (doses of 200 and 300 mg/kg, respectively). Glibenclamide and the R. coriaria seed extract were administered orally for 28 consecutive days . The serum level of total cholesterol (TC), LDL-cholesterol (LDL-c), triglyceride (TG), HDL-cholesterol (HDL-c), activity level of alkaline phosphatase (ALP), glutamic oxaloacetic transaminase (SGOT), and serum glutamic pyruvic transaminase (SGPT) were assessed using commercial kits (Pars Azmoon, Iran) and auto-analyzer method. Levels of very low density lipoprotein cholesterol (VLDL-c) were measured using the Norbert formula, which equals one fifth of TG content . The atherogenic index of plasma (AIP = Log (TG/HDL-C)) was determined as the zone of atherogenic risk . Serum leptin level was measured by ELISA kit (Labor Diagnostika Nord GmbH, Germany) with assay sensitivity of 0.5 ng/mL, intra- and inter-assay CV of 4.3 and 5.8 %, respectively. All data were expressed as mean ± SEM. Statistical evaluation was performed with one-way analysis of variance (ANOVA) t followed by a least significant difference (LSD) test using SPSS Statistics V. 17.01 (SPSS Inc., Chicago, USA). A value of P < 0.05 was considered to be statistically significant. The NA-STZ-induced diabetic group points to significant reduction of body weight in comparison to control group (P < 0.01). 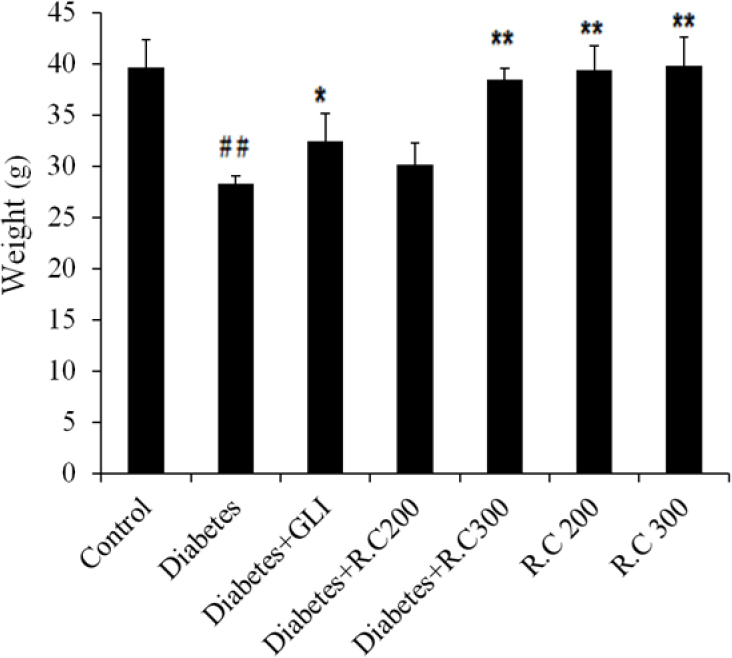 This reduction was reversed significantly after administration of R. coriaria seed extract in distinct period (P < 0.01) in diabetic mice and also healthy mice (dose of 200) as demonstrated in [Figure 1]. Figure 1: Effect of hydroalcoholic extract of R. Coriairia seed on body weight after 4 weeks in NA-STZ-induced diabetic mice. Results are expressed as mean ± SEM. One-way ANOVA and post-hoc LSD tests are applied. * P < 0.05 and ** P < 0.01 are significant differences versus diabetic group. GLI, glibenclamide; R.C. 200, R. coriaria extract (200 mg/kg); and R.C 300, R. coriaria seed extract (300 mg/kg). Induction of diabetes in animals caused reduction of insulin concentration and increase in fasting blood glucose level in comparison to control group as shown in [Table 1], (P < 0.05 and P < 0.001, respectively). Table 1: Effect of hydroalcoholic extract of R. coriaria seeds on insulin, fasting blood glucose levels, HOMA-IR, HOMA-β, QUICKI,and DI. After daily administration of hydroalcoholic extract of R. coriaria seed extract, blood glucose level decreased significantly in doses 200 and 300 mg/kg (P < 0.05 and P < 0.001, respectively), when compared to control group. Although administration of sumac caused increment in insulin concentration in diabetic group this effect was not significant when compared to diabetic group. However, treatment of control groups, animals with both doses of extract significantly increased insulin level (P < 0.05) in comparison with diabetic group. Insulin related biomarkers comprising HOMA-IR, HOMA-β, QUICKI, and DI showed unfavorable change in diabetic group in comparison with control group whose changes in HOMA-β, and DI was statistically significant (P < 0.01). Further, administration of extract in control groups improved DI and HOMA-β significantly after experimental period (P < 0.01 and P < 0.001, in doses 200 and 300 mg/kg, respectively). As shown in [Table 2], NA-STZ-induced diabetes increased LDL (P < 0.05), cholesterol (P < 0.05), atherogenic index, serum levels of VLDL, TG, and decreased HDL (P < 0.05) level in comparison with control group [Table 2]. Although treatment of diabetic animals with R. coriaria seed extract reversed these changes, but just changes in LDL (P < 0.05) at 300 mg/kg and cholesterol (P < 0.05) at both doses was significant after definite period. Further, extract administration in the intact mice increased HDL level (P <0.05 and P < 0.01, at 200 and 300 mg/kg, respectively). Treatment of mice in control group with dose of 200 mg/kg caused significant decrease in LDL (P < 0.05) and cholesterol (P < 0.01) level compared to diabetic control group. Also administration of dose of 300 mg/kg of R. coriaria seed extract significantly reduced triglyceride and VLDL (P < 0.05), LDL (P < 0.01), and cholesterol level (P < 0.001) in comparison with diabetic control group. Table 2: Effect of hydroalcoholic extract of R. coriaria seeds on lipid profile (mg/dL) and atherogenic index. After induction of diabetes by NA-STZ, serum ALP, SGPT, and SGOT levels increased and serum leptin level decreased compared to control group where these changes were significant for SGPT and SGOT (P < 0.05). Although SGOT, SGPT, and ALP levels tend to decrease in treated diabetic mice in both doses of the extract, but were not statistically significant when compared to diabetic group. Also leptin level increased in control group after administration of extract in dose of 300 mg/kg (P < 0.05) compared to diabetic control group [Table 3]. Table 3: Effect of hydro-alcoholic extract of R. coriaria seeds on leptin (ng/dL), SGOT, SGPT, and ALP levels (mg/dL). Type 2 diabetes is a multisystem endocrine disorder with hyperglycemia and dyslipidemia. The available antidiabetic medications are often associated with undesirable side effects such as gastrointestinal reaction . At present, herbs are surrogate by WHO Expert Committee for control of type 2 diabetes . In this study we investigated the antihperglycemic and anti hyperlipidemic effect of sumac (R. coriaria L.) seed extract on NA-STZ-induced type 2 diabetic mice. The β-cell specific toxin STZ was used to induce diabetes through the induction of oxidative stress in β-cells . Also, NA protects β-cells from STZ-induced damage through its antioxidant nature and creates animal models of type 2 diabetes . Several studies have proved that alkylation and breakage of β-cell DNA and also intracellular production of free radical by STZ can harm β-cells, reduce their insulin generating function, diminishing serum insulin level  and nicotinamide through its free radical scavenging potential, partly protects pancreatic β-cells against STZ activity. In our study, elevated blood glucose level and decreased insulin level were observed in STZ-NA-induced diabetic mice compared with control group. Insulin level in type 2 diabetic mice in this study and other similar investigations, imply that some insulin secretary β-cells are intact and still have the potential of insulin synthesis and secretion. Administration of sumac seed extract and glibenclamide in this study significantly reduced blood glucose and increased insulin serum level from the first week to the fourth week compared to diabetic control mice. The probable mechanisms for this effect of sumac seed extract are increase in the pancreatic secretion of insulin or increase in peripheral glucose uptake. Flavonoids especially quercetin are among important ingredients in sumac  and it has been established that flavonoids promote normalization of the level of glycemia in diabetes probably through the inhibition of intestinal absorption of glucose . Also flavonoids are able to protect the β-cells function against oxidative stress induced in pancreatic tissue through its antioxidant properties . So it seems that because of the flavonoids presence in this plant, sumac seed extract could improve β-cells function by reducing oxidative stress in these cells and this probably leads to elevation of serum insulin level and subsequently decrese of blood level. The insulin-related biomarkers including QUIKI, HOMA-IR, HOMA-β, and ID were determined to reveal the health of insulin producing cells and function of insulin in type 2 diabete. Our findings are represented consistent with other studies showing STZ-induced diabetes is along with severe loss in body weight . In type 2 diabetes, body cells are unable to utilize glucose as a source of energy and so progressive decrease of body weight occurs due to tissue protein waste and negative nitrogen balance, perhaps because of insulin deficiency . In the present study, treatment of diabetic mice with sumac seed extract was effective in exerting protection against body weight loss. Our findings on the lipid profile after sumac extract administration point to lowering effect of this extract on lipid profiles, so the weight gain result must be attributed to other mechanism except lipid metabolism pathway and their aggregation. The possible mechanism for this preservative effect on body weight loss could be ascribed to increase in insulin serum level by the extract and thereby inhibition of muscle mass wasting. The liver is a vital insulin-dependent organ and is severely affected during type 2 diabete . Hepatocellular damage in NA-STZ- induced diabetes characterized by increase in serum level of SGOT and SGPT . In our study the serum level of liver enzymes also increased significantly in diabetic group in comparison with control group. The sumac seed extract caused a significant reduction in level of SGOT and SGPT in treated control groups in both doses. The positive effect of the R. coriaria seed extract on liver function may be associated with its antihyperglycemic properties. Insulin can inhibit the hormone- sensitive lipase (HSL) , so activation of HSL during insulin deficiency is along with increase of lipolysis cycle, release of free fatty acids, and enhance of the conversion of fatty acids into phospholipids and cholesterol in the liver and plasma . Although expressing any definite opinion about the effects of extract on liver enzymes, requires more investigation, in our study after induction of diabetes by STZ, a marked elevation in serum cholesterol, LDL, and decrease in HDL occurred in mice which are in agreement with Pierre, et al. findings . Results of our study indicated that R. coriaria after certain period may reverse dyslipidemia associated with diabetes by decreasing the cholesterol and LDL level similar to some other plants previously described . The possible mechanisms in reducing cholesterol level include stimulation of cholesterol-7-alpha- hydroxylase (CYP7A1) converting cholesterol into bile acids, inhibition of cholesterol absorption from the intestine which may be due to formation of complexes with glycosides and saponins , and increasing insulin secretion affecting the process of lipolysis . In our investigation, administration of R. coriaria seed extract and glibenclamide elevated the serum leptin level which was decreased in diabetic group. Leptin reduction has been reported in diabetic animals . Insulin helps glucose uptake and oxidation in adipocyte and leads to increase in serum level of leptin. We have showed that R. coriaria seed extract increased leptin level probably via its beneficial effect on insulin release of β-cells . Moreover, we offer extensive pharmacological and chemical studies in future to clarify the active agent(s) and their precise mechanism responsible for these effects. In conclusion, the results of our investigation suggest that R. coriaria seed extract has antihyperglycemic effects, improves lipid profile levels and also hepatic enzymes activities of diabetic mice and if other studies confirm, it could be useful in treating type 2 diabetes as aforesaid in traditional medicine. University of Medical Sciences of Ahvaz (D- 9206). The authors also thank the experienced personnel of the Health Research institute, Diabetes Research Center of AJUMS. Ahangarpour A, Teymuri Zamaneh H, Jabari A, Malekshahi Nia H, Heidari H. Antidiabetic and hypolipidemic effects of Dorema aucheri hydroalcoholic leave extract in streptozotocin- nicotinamide induced type 2 diabetes in male rats. Iran J Basic Med Sci. 2014;17(10):808-814. Zhang Y, Wu L, Ma Z, Cheng J, Liu J. Anti- diabetic, anti-oxidant and anti-hyperlipidemic activities of flavonoids from corn silk on STZ- induced diabetic mice. Molecules. 2015;21(1):E7. doi: 10.3390/molecules21010007. Ahangarpour A, Oroojan AA, Heidari H, Ehsan G, Rashidi Nooshabadi MR. Effects of hydro-alcoholic extract of Rhus Coriaria (sumac) seeds on reproductive complications of nicotinamide- streptozotocin induced type-2 diabetes in male mice. World J Mens Health. 2014;32(3):151-158. Ahangarpour A, oroojan AA, Heidari H, Ghaedi E, Taherkhani R. Effects of hydro-alcoholic extract from Arctium Lappa l. (burdock) root on gonadotropins, testosterone, and sperm count and viability in male mice with nicotinamide/streptozotocin-induced type 2 diabetes. Malays J Med Sci. 2015;22(2):25-32. Ma Y, Wang Y, Huang Q, Qian R, Su C, Aifang Z, et al. Impaired P cell function in chinese newly diagnosed type 2 diabetes mellitus with hyperlipidemia. J Diabetes Res. 2014(2014), Article ID 493039, 6 pages. Sheweita SA, Mashaly S, Newairy AA, Abdou HM, Eweda SM. Changes in oxidative stress and antioxidant enzyme activities in streptozotocin- induced diabetes mellitus in rats: role of alhagi maurorum extracts. Oxid Med Cell Longev. 2016 (2016), Article ID 5264064, 8 pages. doi.org/10.1155/2016/5264064. Verdin E. NAD+ in aging, metabolism, and neurodegeneration. Science. 2015;350(6265):1208-1213. Zhang Y, Wu L, Ma Z, Cheng J, Liu J. Anti- diabetic, anti-oxidant and anti-hyperlipidemic activities of flavonoids from corn silk on STZ- induced diabetic mice. Molecules. 2015;21(7). doi: 10.3390. Martin MA, Fernandez-Millan E, Ramos S, Bravo L, Goya L. Cocoa flavonoid epicatechin protects pancreatic beta cell viability and function against oxidative stress. Mol Nutr Food Res. 2014;58(3):447-456. Movahedian A, Zolfaghari B, Sajjadi SE, Moknatjou R. Antihyperlipidemic effect of peucedanum pastinacifolium extract in streptozotocin-induced diabetic rats. Clinics (Sao Paulo). 2010;65(6): 629-633. Pierre W, Gildas AJ, Ulrich MC, Modeste WN, Benoit NT, Albert K. Hypoglycemic and hypolipidemic effects of Bersama engleriana leaves in nicotinamide/streptozotocin-induced type 2 diabetic rats. BMC Complement Altern Med. 2012:26;12:264. doi: 10.1186/1472-6882-12-264. Saini SH, Sharma S. Antidiabetic effect of Heliantus annuus L., seeds ethanolic extract in streptozotocin- nicotinamid induced type 2 diabetes mellitus. Int J Pharm Pharm Sci. 2013:5(2):382-387.